Three previously unreleased tracks by rock band Queen, including one which sees singer Freddie Mercury duetting with Michael Jackson, are to finally see the light of day. 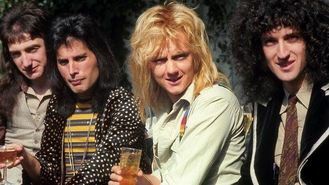 The band's guitarist Brian May and drummer Roger Taylor, who have continued to tour and record as Queen with guest singers, revealed earlier this year that material featuring late frontman Mercury was in the pipeline. Now they have announced the tracks will feature on a collection of the band's love songs which will come out in November. The Jackson track, There Must Be More To Life Than This, was originally written while Queen were working on sessions for their Hot Space album in 1981 but after recording the backing track it was left incomplete. Mercury went on to visit Jackson and record his vocals but despite again working on the song for 1984 album The Works, Queen never finished it and it was released as a solo effort by Mercury for his Mr Bad Guy album the following year. Producer William Orbit, famed for his work with Madonna, said that having the chance to work on the unfinished material was like being handed "a trove of delights provided by the greatest of musicians". "Hearing Michael Jackson's vocals was stirring. So vivid, so cool, and poignant, it was like he was in the studio singing live. With Freddie's vocal solo on the mixing desk, my appreciation for his gift was taken to an even higher level." Mercury died in 1991 at the age of 45, while Jackson died in 2009 aged 50. Also on the new Queen Forever album is Let Me In Your Heart Again, again recorded for The Works but until now it had never been completed. May has recorded new guitar parts. The trio of songs is completed by a full band version of the song Love Kills, a version of which provided Mercury with a top 10 hit when he recorded it with the electronic music producer Giorgio Moroder. Other tracks to feature on the new album include You're My Best Friend, Crazy Little Thing Called Love and Too Much Love Will Kill You. Iggy Azalea has confessed that she only wears her underwear once. Jack White's apparent pop at the Foo Fighters was just a joke, his representatives have said. Tinchy Stryder has revealed he's working on a strange collaboration - with the Chuckle Brothers. Leonard Cohen, who returned to performing after a 15-year hiatus in 2008, says touring has improved his mood. Bono has defended U2's decision to give away their latest album for free - saying it was in the spirit of punk rock. Ariana Grande has dismissed reports that she criticised her fans. La Roux has said she doesn't want another big hit after Bulletproof. Barbra Streisand has teased that a duet with Beyonce could be on the cards.